On Tuesday 3 December UNISON members across Britain’s universities will be joining lecturers in the UCU union and the EIS in Scotland as well as fellow support staff in Unite in their second coordinated strike over an abysmal offer of a 1% pay rise, which amounts to still another cut in real pay. The day of action follows a strongly supported strike on 31 October. In addition, lecturers in the Further Education sector will also be striking in response to an offer of just 0.7% across England and Wales including UCU members at Westminster Kingsway College. * 2pm: March to Bloomsbury Baptist Church, 235 Shaftesbury Ave, WC2 for joint union rally. 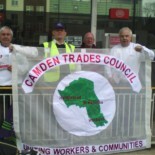 This entry was posted on November 29, 2013 by CAMDEN TRADES COUNCIL.